Hello every one!! 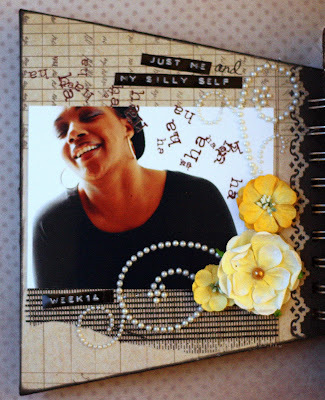 I'm here with another post featuring Quick Quotes fabulous products. 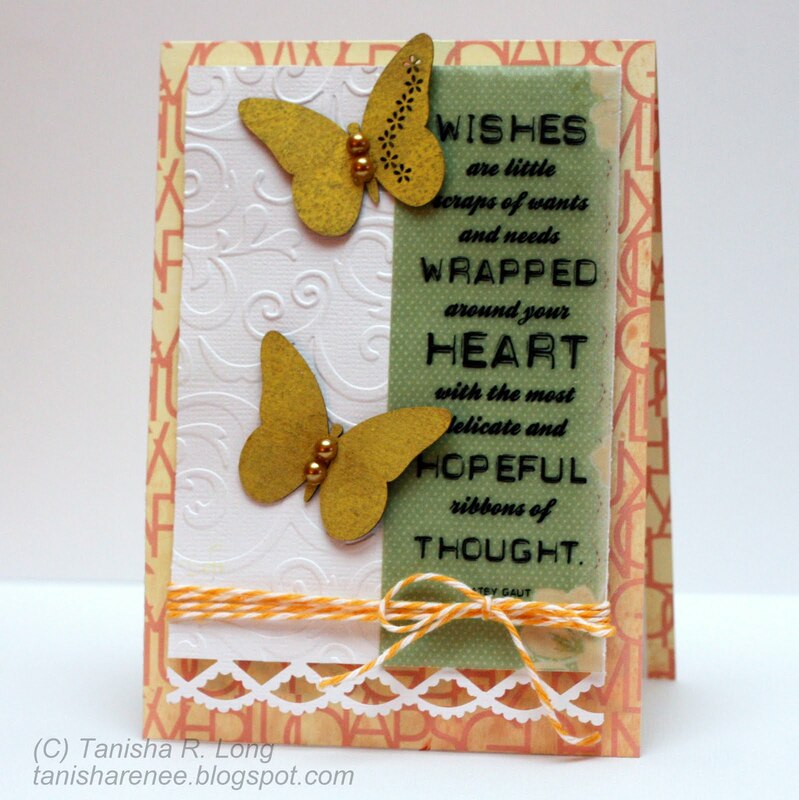 I created a couple of cards using the One Fine Day collection, butterflies bag-o-chips, Wishes Color Vellum, and PowderPuff Inks in Tahiti and Lemonade. 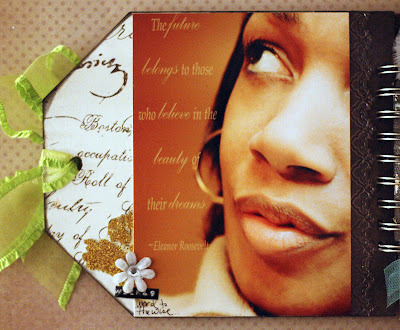 I created the card base from One Fine Day 400, then adhered the Wishes color vellum strip to the side of a piece of embossed cardstock. I inked a couple of the butterflies with Lemonade PowderPuff ink, added pearls to the centers and adhered to the card. 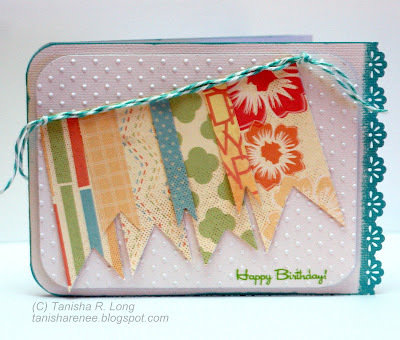 Twine and a punched border helps to finish off the card. 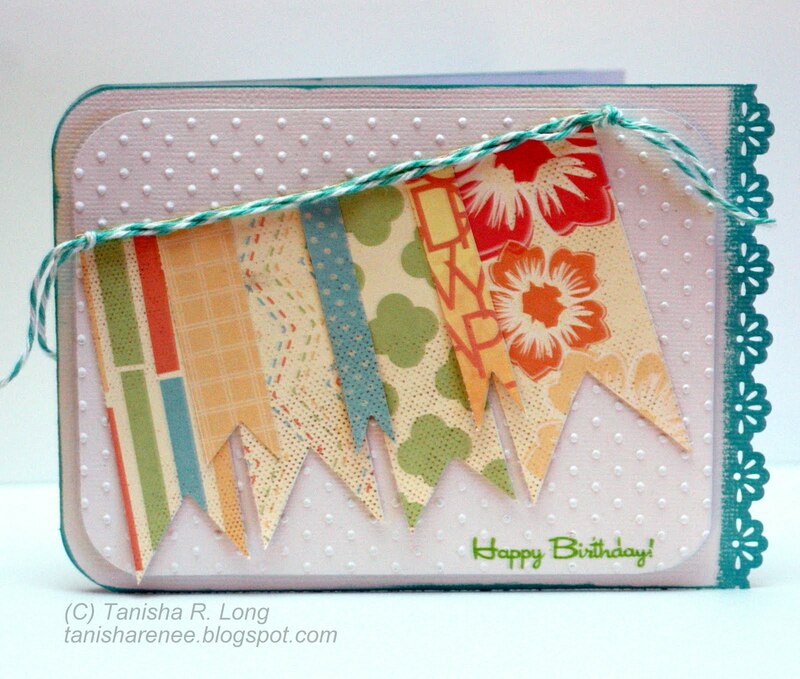 I cut patterned strips from One Fine Day 400 to create the pennant banner on this card. After punching the border along the side, I inked with Tahiti Blue PowderPuff Ink. Remember the 52 week project that I did last year? Well, I took my favorite photos and scrapped them in this mini album by Basically Bare. 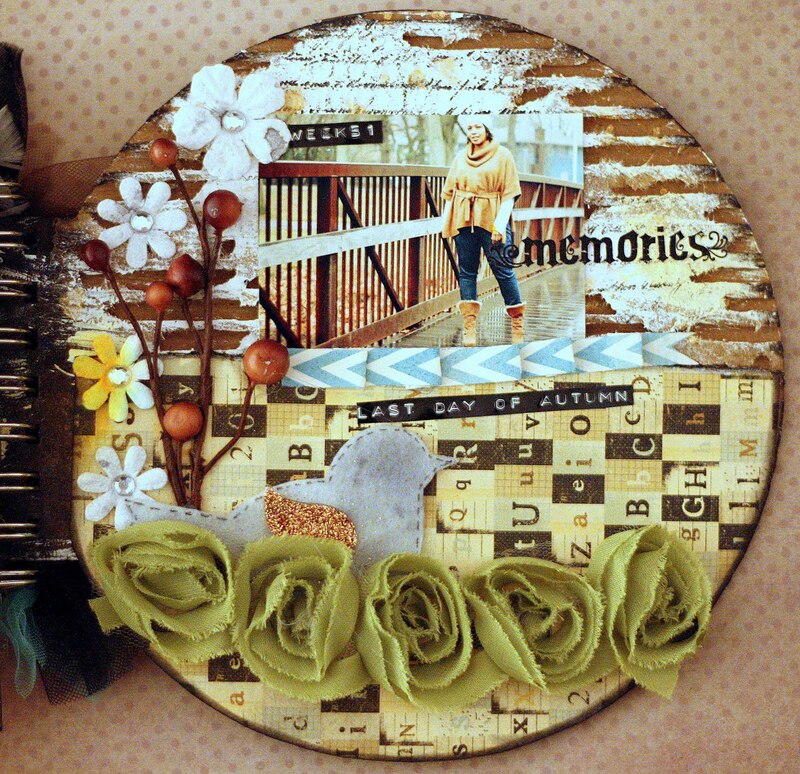 The Rowdy Roadster mixed media album is a mixed media that was released this past CHA. I turned this album into a technique “free-for-all”! I painted, stamped, stickled, heat and dry embossed, and glittered until I liked the results. 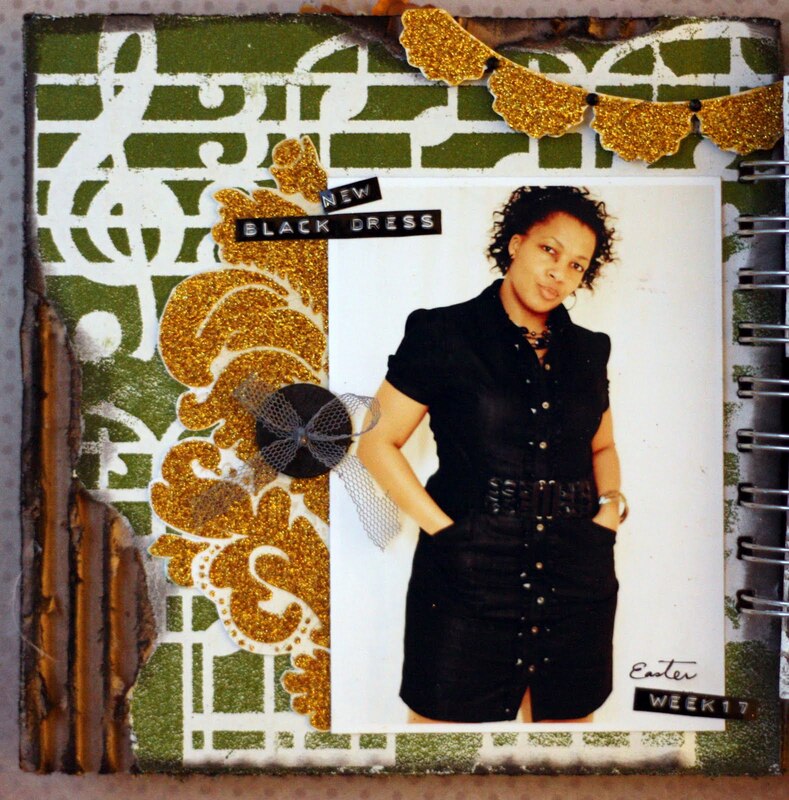 I also used canvas leaves from the Bare Basics Blossoms and Leaves set, a chipboard filmstrip from the Paparazzi Embellie Set, and a chipboard and cardboard dress form from the Dress Me Up Dress forms set, and buttons. 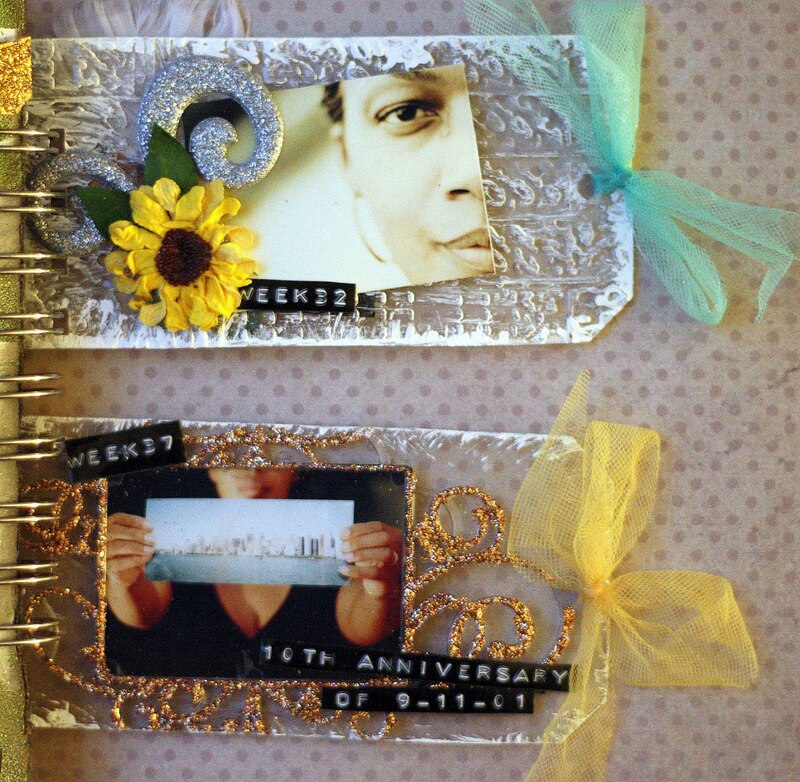 I used WOW embossing powder in high gloss silver on the filmstrip and then swiped it with charcoal ink and white acrylic paint. I dry embossed the dress form and then heat embossed it using copper WOW embossing powder and then covered the bottom with strips of rosettes that were spritzed with shimmering mist. I added feathers (which are really hot right now) and pearls to really “girlify” the dress form. Before adhering the embellishments to the acrylic cover, I added a glittered flourish and swiped the back with white acrylic paint. I added another dress form to the inside cover. I tore away the first layer of cardboard to reveal the ridges. I lightly painted it with white acrylic paint and stamped it using a stamp from WOW’s Call Me Stamp set to add the script print. I love how the different shaped pages add so much character to this album. I painted the canvas leaf with glimmer glaze. Once dried, I slightly curled the end to add dimension. 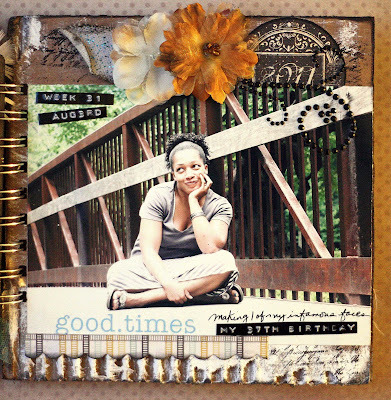 I created the background of this page by inking over a Tim Holtz mask and embossing with WOW powder in earth tone olive. 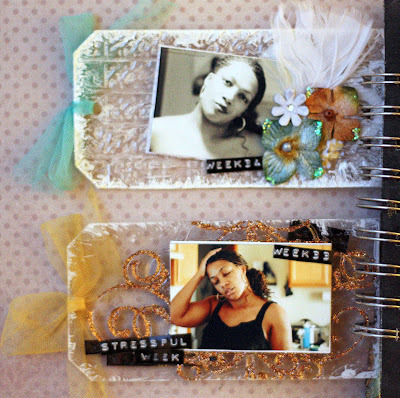 I ran both tags through the cuttlebug before swiping with acrylic paint and adding stickles. 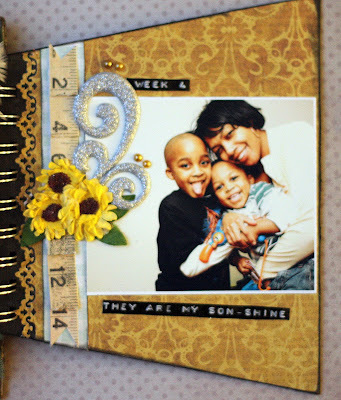 I love the texture that the dry embossing adds! I swiped both with white acrylic paint so that they would stand out against the the canvas page that follows. I hot glued feathers and Petaloo flowers to the top tag and coated the embossed flourish with PK Glitz glitter on the bottom tag. 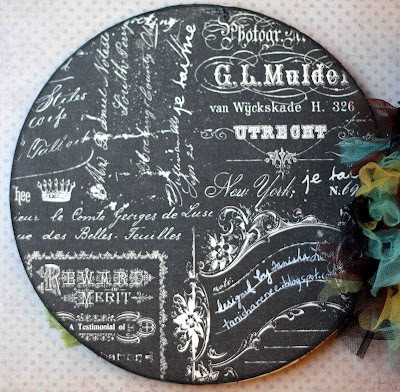 I tied tulle through both tags for an added feminine touch. This canvas page was really fun to work on. I embossed the page using WOW embossing powder in earth tone nutmeg and WOW’s brocade stamp. I have to admit, heat embossing such a large canvas area was tedious work. I had to heat it longer than paper but just shy of actually burning the fabric. Once that was done, I stitched around the page, about 1/2″ from the edge and then frayed and inked the edges. The stitching and fraying were already done from the front side of this page. 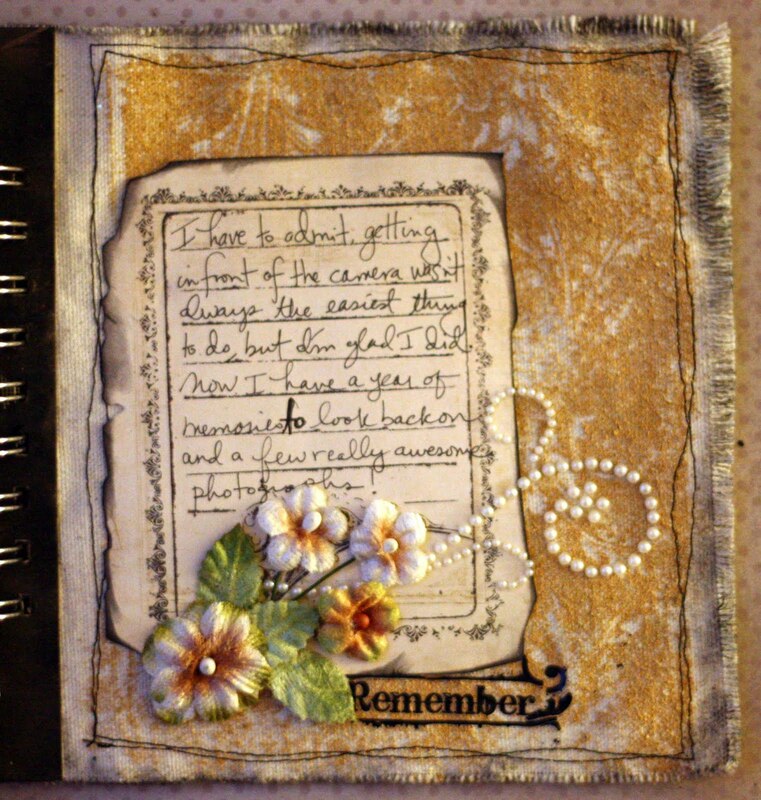 I used a mask and shimmering mist to create the background and then added rub-ons and embellishments once the page was fully dried. 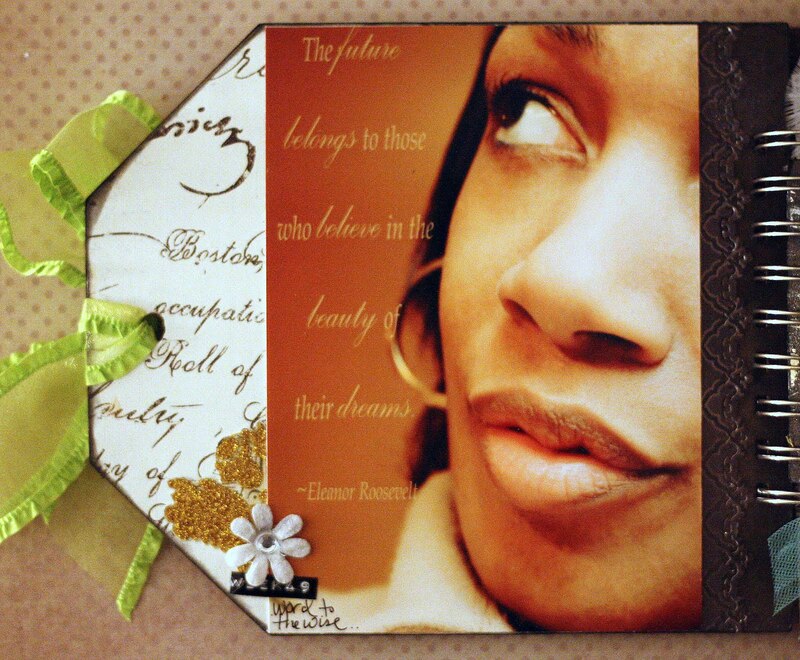 This tag is wonderful for displaying either a couple of small photos or one large photo. I chose to keep the embellishments simple and added 2- 5×7 photos (one to either side of the page) and sheer ribbon for a pop of color. 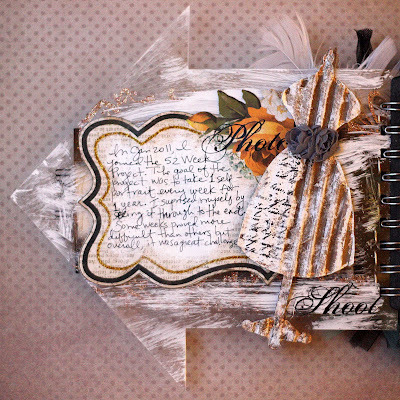 I tore off the top layer of the inside of the back cover and covered the bottom with patterned paper. I painted, stamped, and added rub-ons to the exposed ridges. I nestled a felt Stack-A-Bellies Bird in the strip of rosettes, but not before spritzing it with Silver Foil glimmer mist. 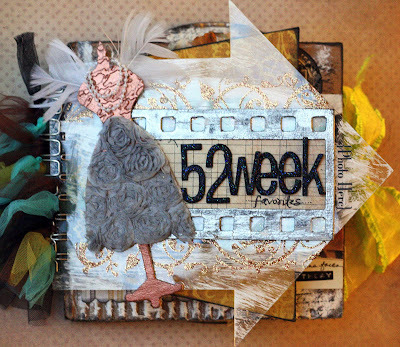 I attached a chipboard wing that was coated with glitter and then added pen work to the bird. 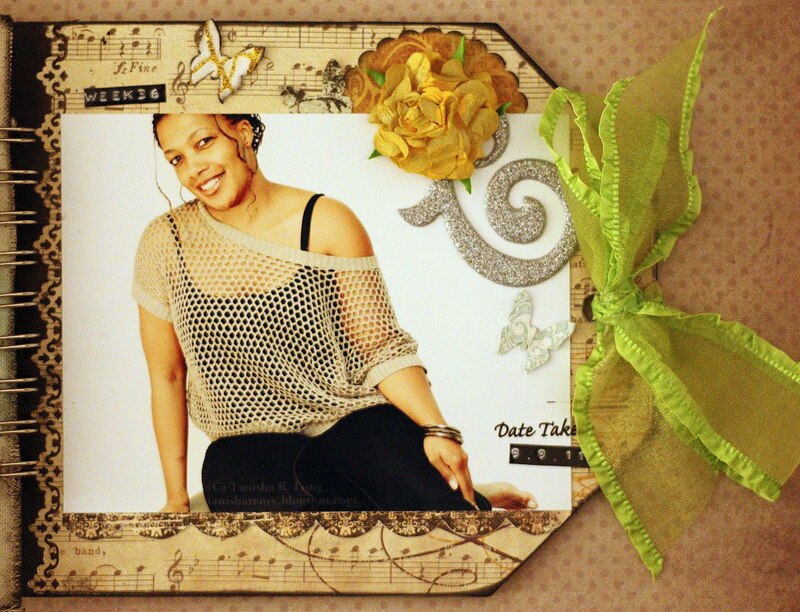 I covered the back cover with patterned paper and added strips of tulle to the rings to finish off the album. This is probably the chunkiest album I’ve ever made, but I love every inch of it!! 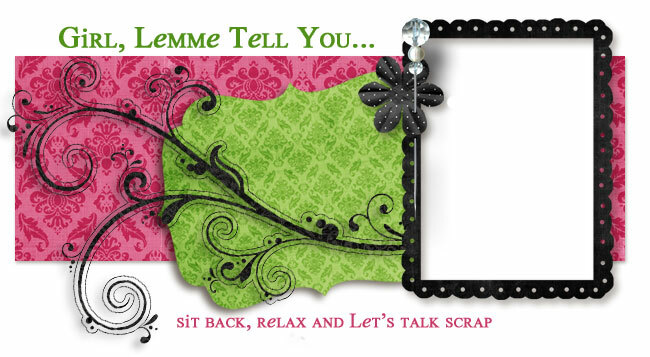 That’s all for now…until next post…happy scrapping!! Good day everyone! 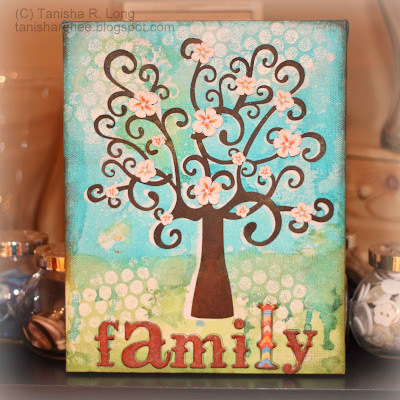 Today, I have another Quick Quotes project to share featuring the 8x10 chipboard Whimsical Tree on a canvas. This is only my 2nd canvas and I had a ball creating it. I started by using bubble wrap and embossing ink to stamp the background and then embossed with WOW's Opaque Brite White embossing powder. 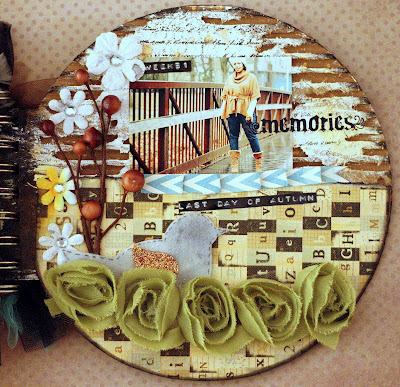 I used the Whimsical Tree as a mask and painted over it with Radiant Rain Shimmering Mists from Luminarte in key lime, teal zircon, and ocean wave and then used a damp paper towel to wipe the paint off of the embossed circles. I lightly inked over the painted areas with Amaretto PowderPuff Chalking Ink. I inked the tree with Amaretto PowderPuff Chalking Ink and aligned it slighlty to the right of the masked area so that the masking serves as a drop shadow. I cut flowers from Summer Samba 400 and added to the tree. I used Summer Samba 200 to highlight the letter "L" in family, which happens to be the first letter of my last name. Here's a close-up of the flawers on the tree. I inked the sides of the canvas using Green with Envy PowderPuff Chalking Ink and Baja Blue PowderPuff Chalking Ink which matched the paint perfectly!! That's all for now!! Have a scrappy day! !